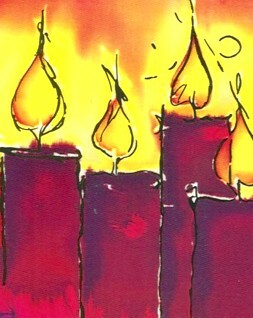 It is Candlemass to-day, - so called from the lighting up of candles, offering them, consecrating them, and bearing them in procession; a custom from the time of Justinian the Emperor, at the latest about 1100 years ago; or as others say, Pope Gelasius, anno 496, or thereabouts; - to show that long expected Light of the Gentiles was now come, was now sprung up, and shined brighter than the sun at noon, and might be taken in our hands. Let the ceremony pass, reserve the substance; light up the two candles of faith and good works, light them with the fire of charity; bear we them burning in our hands, as Christ commands us; meet we him 'with our lamps burning;' consecrate we also them, all our works and actions, with our prayers; offer we them, all our works and actions, with our prayers; offer we them upon the altars of the God of our salvation, bini et bini, as S. Bernard speaks, as in procession, 'two and two,' in peace and unity together; and with this solemnity and preparation, we poor oxen and asses may come and approach to our Master's crib. The crib is the outward elements, wherein he lies wrapped up; they are the swaddling clothes and mantles, with which his body is covered when he is now offered up to God, and taken up by us. Take them, and take him; the candle of faith will there show you him, and the candle of charity will light him down into your arms, that you may embrace him. We embrace where we love, we take into our arms whom we love; so that love Jesus and embrace Jesus - love Jesus and take Jesus - love Jesus and take him into our hands, and into our arms, and into our mouths, and into our hearts. Take him and offer him again; take him up and offer him up for our sanctification and redemption, to redeem us from all our sins, and sanctify all our righteousness; for without him nothing is righteous, nothing is holy. This day was his offering day - is to be ours. Offer we then him, offer we ourselves; take we him up into our arms, into our hands and hearts; having first lighted a candle and swept our houses to receive and entertain him, and having humbly, and cheerfully, and devoutly, and thankfully received him, bless we God. - From a sermon preached by Mark Frank on Candlemass in the 17thC. L. Forty days ago the Church celebrated the birth of our Lord Jesus Christ. To-day we rejoice with Simeon and Anna as the baby Jesus is presented in the Temple, when He is offered to the Father and shown to His people. His mother, our dear Lady, is also purified according to the Jewish Law. To-day is also seen as a bridge between Christmass and Good Friday. Simeon's words to Mary remind us to look ahead to Christ's passion. Mary's soul will be pierced as she stands at the foot of the Cross watching her Son die His agonising death. L. From the Virgin Mary shines forth Jesus, our Saviour. R. Sun of Righteousness, our God for ever. L. He gives light to those in darkness. R. To be purified according to the Law. Scriptural Reading from: Leviticus 12.6- 7. And when the days of her purifying are fulfilled, for a son, or for a daughter, she shall bring a lamb of the first year for a burnt offering, and a young pigeon, or a turtle dove, for a sin offering, unto the door of the tabernacle of the congregation, unto the priest. Who shall offer it before the Lord, and make an atonement for her; and she shall be cleansed from the issue of blood, This is the law for her that hath born a male or female. That watched thy slumbering ey. A Reading from a sermon of Sophronius, Patriarch of Jerusalem +638. Let us all hasten to meet Christ, we who honour and venerate the divine mystery we celebrate today. Everyone should be eager to join the procession to share in this meeting. Let no one refuse to carry a light. Our bright shining candles are a sign of the divine splendour of the one who comes to expel the dark shadows of evil and to make the whole universe radiant with the brilliance of his eternal light. 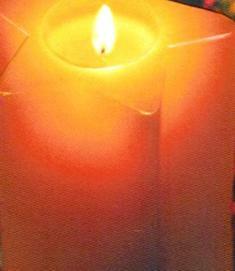 Our candles also show how bright our souls should be when we go to meet Christ. The God-bearer, the most pure Virgin, carried the true Light in her arms and brought him to help those who lay in darkness. In the same way, we too should carry a light for all to see and reflect the radiance of the true light as we hasten to meet him. Indeed, this is the mystery we celebrate today, that the Light has come and has shone upon a world enveloped in shadow; the Dayspring from on high has visited us and given light to those who were sitting in darkness. This is our feast, and we join in procession with lighted candles to show both that the light has shone upon us and to signify the glory that is yet to come to us through him. So let its hasten all together to meet out God. The true light has come, 'the light that enlightens every person who is born into this world'. Let all of us, beloved, be enlightened and be radiant with its light. Let none of us remain a stranger to this brightness; let no one who is filled remain in the darkness. Let us be shining ourselves as we go together to meet and to receive with the aged Simeon the light whose brilliance is eternal. Rejoicing with Simeon, let us sing a hymn of thanksgiving to God, the Origin and Father of the Light, who sent the true Light to dispel the darkness and to give us all a share in his splendour. Through Simeon's eyes we too have seen the salvation of God which he has prepared for all the nations, and has revealed the glory of us who are the new Israel. As Simeon was released from the bonds of this life when he had seen Christ, so we too were at once freed from our old state of sinfulness. By faith we too embraced Christ, the salvation of' God the Father, as he came to us from Bethlehem. Gentiles before, we have now become the people of God. Our eyes have seen God made flesh, and because we have seen him present among us and have cradled him in our minds, we are called the new Israel. Never let us forget this presence; every year let its keep this feast in his honour. Prayer - On this day Mary, our Lord's mother was purified forty days after the birth of her Son according tothe Jewish Law, purify our hearts that our hearts may be like Mary's, single-minded in devotion to you; we ask this through her beloved Son, Jesus Christ our Lord. Amen. Mary and Joseph brought the child Jesus to the Temple in Jerusalem "to present him to the Lord" according to the Law. L. Consecrate to me all the first born. R. They will be offered to the God of Israel. L. Christ gives light to those in darkness. Sanctify unto me the first-born, whatsoever opens the womb among the children of Israel, both of man and beat: it is mine. He is the image of the invisible God: the first-born of all creation. For by him all things were created that are in heaven, and that are in earth, visible and invisible. He is the head of the body, the Church: who is the beginning, the firstborn from the dead. Comes to the temple gate. No crowds his coming wait. A "child" it is that is presented in the text and in the day; and the "child Jesus." Such a child is both example and authority enough for us to bring ours also to the Lord whilst they are such; unless we think our children are holier than he - want less than he - can be without God better than he - more above the law than he. They "brought in the Child." And what better present can they bring, can any parents bring and offer, than a child? How can they express their devotion more to God, than by offering what is dearest? He was (1) the first-born, and therefore to be offered and presented. The first-born was God's: "All the first-born are mine," says he, "both of man and beast." And Christ, he is "the first-born of every creature," says St. Paul. So in him they are offered altogether, man and beast - all sanctified by him: men that live like men, and men that live like beasts; qui computruerunt sicut jumenta in stercore suo: who wallow in their own dung, in their own sins, "like the beasts that perish;" for the righteous and for the sinner both is he offered, that both might have access to God through him; that man and beast too, according to the letter, might, as the Psalmists says, be saved, that is, blessed and preserved, through him. He was the first-born (2) of his Father, the first and only-begotten Son of God; so to be presented upon that title. He was (3) the first-born of his mother, the first and only son first born though not begotten there; but first-born was sufficient to entitle him to God. The Apostle calls him (4) "the first-born among many brethren;" he our elder, and we the younger brethren. The same Apostle (5) calls him the "first-born of the dead." So that now being the first-born both by Father and mother, both in heaven and earth, of quick and dead, of every creature, no great wonder to hear of his presenting to the Lord. In the Gospel narrative for this feast the main part is concerned with the meeting between the elderly priest Simeon and the Infant Jesus. This meeting gave this festival its name in the Greek Church Hyapante (= meeting ) and is seen as the fulfilment of Malachi's prophecy: "The Lord whom you seek will suddenly come to the Temple." One of the loveliest scenes depicted by Luke is the endearing cradling by Simeon of the Babe. R. To take in his arms him who gave the Law of Moses and is the Law's fulfilment. L. Simeon rejoices, in old age carrying the Redeemer of the world. And behold, there was a man in Jerusalem, whose name was Simeon; and the same was devout, waiting for the consolation of Israel: and the Holy Spirit was upon him. Then he took he him up in his arms and blessed God. Praise to you, Son of the Most High, who has put on our body. having pity on my old age, making my bones enter into Sheol in peace. to his lips and opened his mouth. Anna was aglow with the spirit of his mouth. 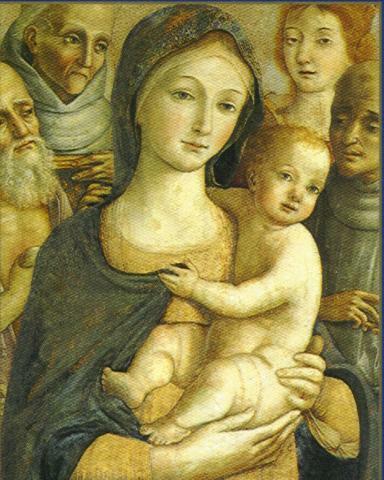 Prayer: Simeon took the blessed infant Jesus into his arms and gave thanks to God for being able to see Him,the promised Messiah who will be the Light of the World; help us to be thankful every day for our Saviour who has given us the promise of eternal life in Him; this we ask through the eternally begotten Son, Jesus Christ. Amen. Anna an old prophetess had spent most of her life in the Temple waiting patiently for this day to come. Like Simeon she too could now die in peace. R. Proclaiming the Saviour and Israel's deliverer. L. Anna prophesies in the temple of our God. L. He is the one who offers and is offered for us. L. He bestows on us his risen power. S. Sun of Righteousness, our God for ever. Scriptural Reading: St. Luke's Gospel 2. 36-39. And she coming in that instant gave thanks likewise unto the Lord, and she spake of him to all that looked for redemption in Jerusalem. Lo, th' Incarnate God most high. Today as we bear in our hands lighted candles, how can we not fail to remember that venerable old man Simeon who on this day held the child Jesus in his arms - the Word who was latent in a body, as light is latent in a wax candle - and declared him to be 'the light to enlighten the nations'? Indeed, Simeon was himself a bright and shining lamp bearing witness to the Light. Under the guidance of the Spirit which filled him, he came into the temple precisely in order that, 'receiving your loving kindness, O God, in the midst of your temple', he might proclaim Jesus to be that loving kindness and the light of your people. 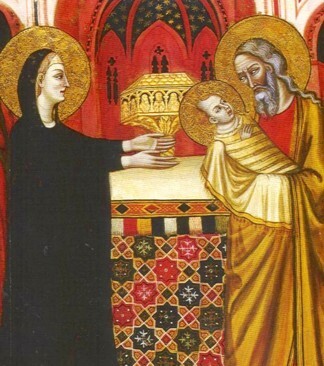 Behold then, the candle alight in Simeon's hands. You must light your own candles by enkindling them at his, those lamps which the Lord commanded you to bear in your hands. So come to him and be enlightened that you do not so much bear lamps as become them, shining within yourselves and radiating light to your neighbours. May there be a lamp in your heart, in your hand and in your mouth: let the lamp in your heart shine for yourself, the lamp in your hand and mouth shine for your neighbours. The lamp in your heart is a reverence for God inspired by faith; the lamp in your hand is the example of a good life; and the lamp in your mouth are the words of consolation you speak. We have to shine not only before others by our good works and by what we say, but also before the angels in our prayer, and before God by the intentions of our hearts. In the presence of the angels our lamps will shine with unsullied reverence when we sing the psalms attentively in their sight or pray fervently; before God our lamp is single-minded resolve to please him alone to whom we have entrusted ourselves. My friends, in order to light all these lamps for yourselves, I beg you to approach the source of light and become enlightened --- I mean Jesus himself who shines in Simeon's hands to enlighten your faith, who shines on your works, who inspires your speech, who makes your prayer fervent and purifies the intentions of your heart. Then, when the lamp of this mortal life is extinguished, there will appear for you who had so many lamps shining within you the light of unquenchable life, and it will shine for you at the evening of your life like the brightness of the noonday sun. And though you may think your light is quenched in death, you will rise like the daystar and your darkness be made bright as noon. As Scripture says, 'No longer will you need the light of sun to shine upon you by day, or the light of the moon by night; but the Lord will be an everlasting light for you.' For the light of the new Jerusalem is the Lamb. To him be glory and praise for ever. Prayer: Anna welcomed the Christ-Child with great joy and satisfaction, help us O Lord, even in those darkest moments to let our hearts be filled with the joy of knowing that You are our Lord and Saviour who died and rose from the grave for us; this we ask in Your name. Amen. When all had been accomplished Joseph and Mary and little Jesus returned to their home in Nazareth. All had been accomplished according to the Law of Moses. R. Let us welcome Christ the King of glory. L. The Word has come to earth and appears in the temple. L. To him let us cry: Christ our God, at the prayers of the Mother of God. And when Mary and Joseph had performed all things according to the law of the Lord, they returned into Galilee, to their own city Nazareth. who was incarnate for us, and speaks by the Law. Him let us worship. yet does not abandon his divine nature. willingly to the Law's temple. cries the servant to the Master, for my eyes have seen your salvation. You have come into the world to save the human race: glory to you! to take in his arms him who gave the Law to Moses and is the Law's fulfilment. Moses was deemed fit to see God in darkness and by hidden voice; his face veiled, he rebuked the Hebrews' faithless hearts. Simeon held the Father's Word, eternally begotten, become incarnate, and revealed the nations' light, the cross and resurrection. Anna was revealed as a prophetess, proclaiming the Saviour and Israel's deliverer. To him let us cry: Christ our God at the prayers of the Mother of God have mercy on us. God be gracious unto us, and purify our hearts and hands, that we may worthily receive Christ; strengthen our arms, that we may hold him; open our mouths, that we may bless him on this day and glorify him for ever. You have given us your word for light to shine upon our path. Help us to meditate on that word, so that Your light may shine more and more until the perfect day. O God, who in the work of creation commanded the light to shine out of darkness, so we pray that the light of the glorious Gospel may shine into the hearts of all your people, dispelling the darkness of ignorance and unbelief, and revealing to them the knowledge of your glory in the face of Jesus Christ our Lord. Amen. To finish let us ponder on those enlightening words of blessed Simeon. eternal Wisdom, scatter the darkness of our ignorance; eternal Pity, have mercy on us; that with all our heart and mind and strength we may seek your face. And may + God the Father, Son and Holy Spirit, bless, persevere and keep us this day and for evermore. Amen.